EverWing players in the country now have an even more reasons to play and get excited about the game starting tomorrow. Smart Communications Inc and Blackstorm Labs have forged partnership to launch the EverWing Philippine Dragon Festival. One of the biggest part of this collaboration is the creation and addition of Filipino mythical beasts as dragons to the game. Smart, through their Facebook page, has just made the big announcement by unleashing the names of these beasts that we can expect to arrive starting tomorrow July 19 at 1PM. The five arriving Pinoy creatures as dragons aka sidekicks that players can hatch, level-up, and eveolve are the Buwaya, a crocodile with a saddle on its back, Kiwig, a fierce and fiery pig, Lampong, a bright-eyed deer with a long beard, Bakunawa, a serpentine dragon, and Sarangay, a bull with muscular build and bejeweled ears. "This lineup of Philippine dragons is our treat to millions of Filipinos, who are among our most engaged and passionate players in the world," said Michael Carter, CEO of Blackstorm. "With their distinct characteristics, these Filipino dragons will surely take your game to the next level, so we hope the entire world will enjoy this update." 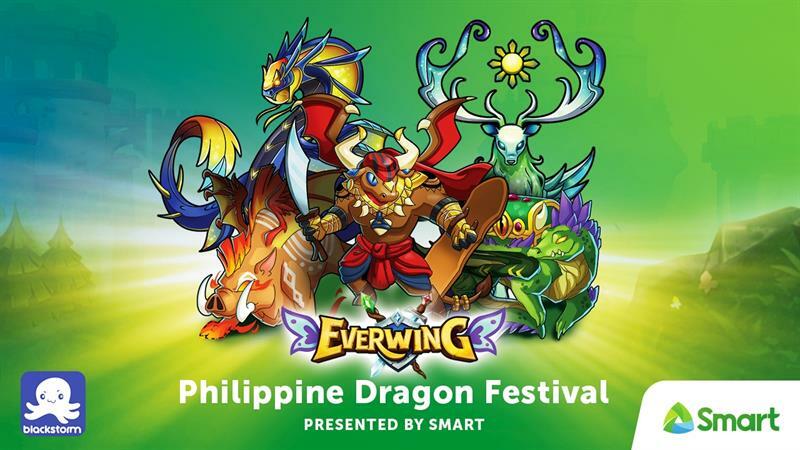 "Smart is one with EverWing fans and gamers in welcoming this latest line-up of dragons, which draws from rich Philippine folklore to give the game a uniquely Filipino flavor," said PLDT and Smart First Vice President and Wireless Consumer Division Head Renren Reyes. In case you are still not familiar with the EverWing game yet, it is developed by US-based Blackstorm Labs and is an endless shooter type of game. Players control a Guardian of their choice with its dragon sidekicks to fight monsters and bosses as they progress in the game. EverWing is not an app-based game though that you can download from Google Play or App Store, it is one of those exclusive mobile games that can be accessed via Facebook Messenger app. Being a Facebook Messenger-based mobile game means you need to be connected online in order to play, either via WiFi of mobile data. And speaking of mobile data needs, Smart's biggest GigaSurf 50 is one of the best bundles to select as it offers 1GB of data, additional 300MB for video streaming, and unli text to all networks. All valid for three days for only Php50. To subscribe, just text GIGA50 to 9999.
how to get those dragons? I already have the 2 dragons pong and nuno. The previous evolve form of buwaya and lampoon I guess. And their ability is the same as legendary even though they are just rare dragon. so how were you able to get them? do we need to pay for the philippine dragons? I don't think we do. We can just get them the way we get others. are these dragons limited edition?